Billy McKinney was drafted by the Athletics in the 1st round of the 2013 draft, after batting .372 with 4 home runs and 17 RBI’s during his senior year of high school. Since the draft, McKinney has posted solid numbers between three different levels of professional baseball, hitting a combined .283, and truly showing why he was so highly thought of by the A’s in the 2013 draft. However, despite seemingly being a big part of the Athletics’ future, McKinney was traded to the Cubs’ organization in July as part of the trade that sent Jeff Samardzija (now with the White Sox) to the Athletics. But the trade turned out to be great for McKinney, who was batting just .241 through 75 games worth of at-bats before the swap. Following the team change, McKinney hit .301 to finish out the season, bringing his combined average for 2014 up to .264 to go along with 11 home runs and 69 RBI’s. A great turnaround after the slow start McKinney had to begin 2014. If McKinney can continue to develop into the player he’s expected to become, it won’t be long before he’s a part of the Cubs’ future at the major league level. I started playing tee ball when I was 3 years old. My parents [were my biggest influences], as both of them helped me in different ways. My mother helped me keep a positive attitude regardless of the situation, and my father helped with my development. Josh Hamilton, [for] two reasons. One: I admired his swing and power. Secondly: I respected him for the challenges he overcame to become an MLB player. 3.) You were drafted by the Athletics in the 1st round of the 2013 draft. What was that process like for you? Where were you when you first found out? Initial thoughts? It was an exciting and enjoyable time, balancing all the scout home visits, hitting sessions for various teams, and playing my final high school season. My family was fortunate to be asked to attend the draft at the MLB Studio. It was an opportunity to be there with eight other players who were expected to be drafted. When Mr. Selig called my name as an Oakland Athletic I was ecstatic, as I had always admired them being a great baseball team. I was pumped being picked by such a strong baseball club that focused on solid fundamentals. 4.) After finishing out 2013 with short-season Vermont, you were moved all the way up to High-A Stockton to begin 2014. Struggling at times with Stockton, what did you find most challenging about making the jump to that level of baseball so quickly? Most definitely was adjusting to the quality of pitching in High-A. Some very, very good pitching in both the California League and the Florida League. 5.) In July, you were a part of a multi-player trade for Jeff Samardzija that sent you from the Athletics’ organization over to the Cubs’. How did you react when you first heard about the trade? What was it like making the switch in organizations mid-season? I was shocked at first, although as time passed I quickly realized baseball is a business and the Cubs are a quality organization with great leadership. At first it was different, although my Daytona Cub teammates made it a very easy transition, welcoming me to the team. 6.) Upon your transition to the Cubs’ system, you were able to get a fresh start, recording solid numbers with their High-A club to finish out the year. What was it about your new team that made it easier for you to perform at a higher level than you did the first half of the season? It was basically making adjustments in my approach to the quality of pitching in High-A and learning from previous experiences. Bus rides and downtime, although being together as a team helps ease the boredom. [We] hang out together and/or watch TV. 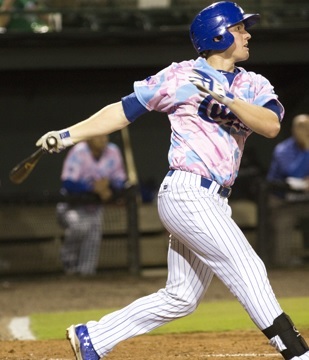 [In 2014, I] learned throughout the year and appreciated the opportunity to play for the Florida State League Championship with the Cubs. [Goals for 2015 are to] help the Cubs in anyway I can and to continue to develop as a player and person by being challenged. Work hard and never give up, regardless of the situation. Also, embrace your teammates, as baseball is a team sport. Big thanks to Billy McKinney for taking the time to answer my questions. This entry was posted in Dailies and tagged 2014, Athletics, Baseball, Billy McKinney, Cubs, Interview, MiLB, Twitter by Matt Huddleston. Bookmark the permalink.